Yesterday, representatives from government and the community braved the cold to hold a rally and press conference to try to push forward the stalled plan to bring shore power to the Brooklyn Cruise Terminal in Red Hook. 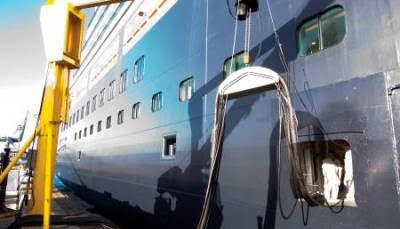 This is a plan that will allow the cruise ships to turn off their extra-dirty diesel engines while in port instead of idling, as they currently do, spreading dangerous substances through the air of the neighborhoods of Red Hook, Carroll Gardens, the Columbia Waterfront, Cobble Hill and beyond. In attendance were Councilmember Brad Lander, state Sen. Daniel Squadron, Congresswoman Nydia Velazquez, State Sen. Velmanette Montgomery and Councilmember Stephen Levin. Also in attendance were representatives of Rep. Jerrold Nadler (who's district includes the Red Hook waterfront and a few of its residents) and CM Lander conveyed the support of Councilmember Sarah Gonzalez, who represents Red Hook in the City Council, who was absent. We should be thankful that those who are representing us in government are providing the political muscle to try to break the deadlock that is stopping this deal, more than two years in the making, from being finalized. It's been missing in the past, but, in recent years, Congresswoman Velazquez, CM Lander and Senator Squadron have really taken the lead on this. I'm happy to say the others are now truly "on board", and at the rally showed themselves to be outspoken advocates for our communities on this matter. Rather than explain the details of what the "hold up" is with making this deal happen and finalizing this plan (I've discussed that at length in my previous posts), please take a look at the list of articles at the bottom of this post that this event generated in local news and blogs. 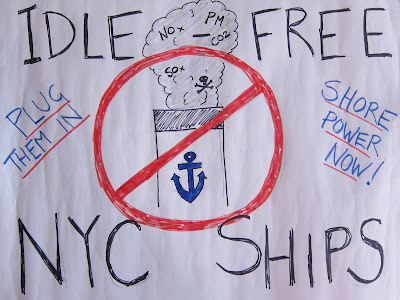 After spending many years asking questions (writing my first letter to the City in 2005 about whether "shore power" was going to be used at the $56 million Brooklyn Cruise Terminal being built at the end of my young family's residential street), trying to educate myself about, and raise awareness of the issue of ship pollution - not only with cruise ships, but with container and cargo ships too - and after starting this blog in early 2009 in response to the frustration I was feeling about the lack of action on this matter, the lack of political advocacy, the absence of coverage in the media, and in an effort to try to spread the information that I had gathered concerning the problems and solutions regarding the impacts of port pollution, I am so pleased to see this matter being given the coverage it deserves in the press. It's something that should be being getting broad coverage and a matter that should be addressed seriously by the Ports of New York and New Jersey. In reality, the plan for "shore power" at the Brooklyn Cruise Terminal should be the first step in implementing this pollution mitigating practice throughout our city's ports - cleaning the air and bringing the resultant health benefits to all of our city's residents. Hopefully, this recent coverage will help to push this initial, important process forward - urgently. The bottom line is (and many people said this) - this is taking too long. All parties involved agree this should happen. The EPA has made statements that this plan will eliminate tons of harmful substances from our neighborhoods' air and the lungs of those who are most vulnerable to their impact - "children, the elderly, people with lung disease" and asthma. The Port Authority has stated that this plan will save Brooklyn residents a monetized amount "that approaches $9 Million" in yearly health costs - that's in cancer, heart and lung disease, premature mortality and asthma - every year. I don't really care about the quibbling, who wants to pay, who doesn't. At the moment it's our residents who are paying, many who are the most vulnerable in our community. As others have also said, this is a matter of "environmental justice". All I can say is let's get this done. For our kids. For our neighborhood. For our city. 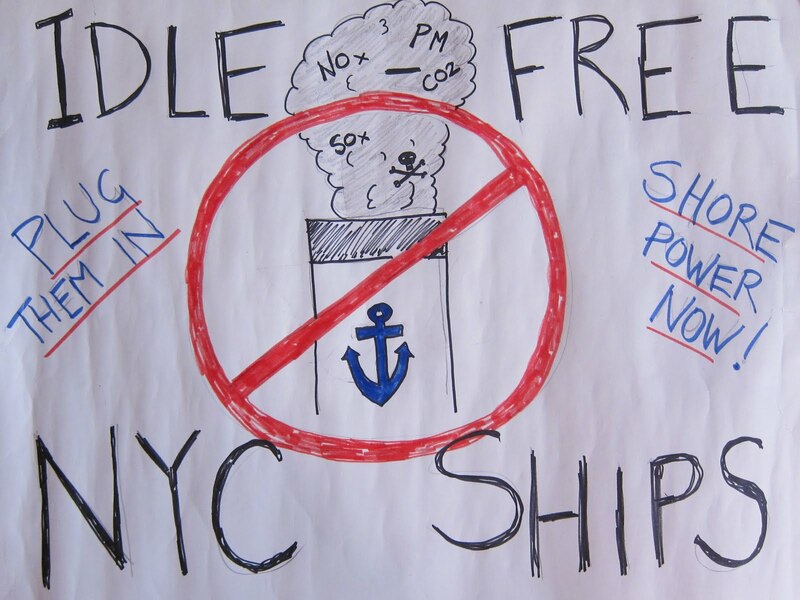 NY 1 NEWS - "Advocates Make Push for "Shore Power" in Brooklyn"
BROOKLYN DAILY EAGLE - "Officials Call for Cleaner Power at Cruise Terminal"
As long as there is no threat of sanctions, and no resulting hit to the Cruise Line's profits, they could drag this on indefinitely. Right now there is no real cost to Carnival to continue dragging their feet. My own opinion is that asking for shore power is only a tiny, but somewhat expensive, first step. And it benefits one tiny area. I think the cruise lines know this. They might also worry that any capitulation, no matter how small, will eventually lead to further demands. The End Game is full environmental retrofit of the entire fleet, something that can cost upwards of 20 million in capital costs per ship plus higher costs for maintenance and operation of particular emissions systems. But then, with a fleet of 22 ships and 11 Billion in profits the last 5 years (http://nyti.ms/h1A8ZS) you'd think they could easily afford even an extreme measure like that. Though the loss of revenue due to downtime for each ship's retrofit would sting. So, yeah, definitely a "low hanging fruit", but until their bottom line is threatened by unified and decisive public policy they're gonna keep dicking around. In a proper negotiation you put an immediate total ban on bunker fuel and demand complete emissions retrofit (scrubbers, EGR, water-in-fuel systems, low sulphur fuels) within an obnoxiously tight timeframe. Then you settle on a fast-track shore power compromise. They feel like they got off easy. Too low a fruit. No response. Clearly, old school peaceful, legal and direct action is called for. I guess the real question is: With each of your ships averaging over a hundred million in profit per year, what's the hold up? Brian, your excellent comments have inspired my new post. Thanks.